R.AN.B.T. and 12th Brigade A.F.A. FIELD DIARY from enlistment, 24 March 1915, to Harold's fatal gassing 15/16 August 1918. (TRANSCRIBED by Walter J R Barber). Article - Diamond Valley Community Hospital / by Gemma Sprague and Rosalie Bray. 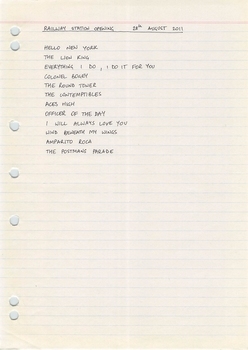 3 pages, text and images. A short history of Diamond Valley Community Hospital from the perspective of former nurse and patient Gemma Sprague. 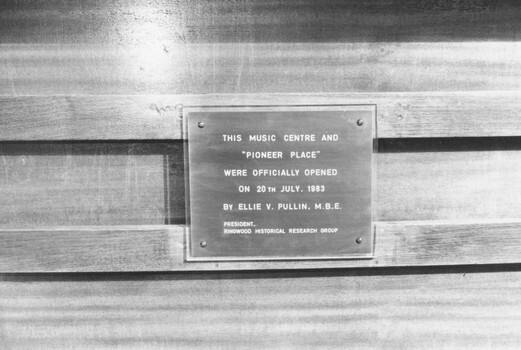 DVCH was Greensborough and district's local community hospital during the 20th century. Story first published in "As I Recall" in 2013. 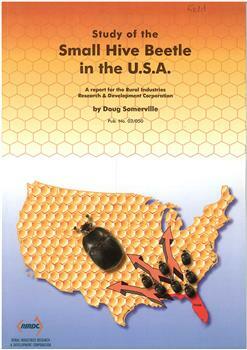 Publication - Study of the small hive beetle in the U.S.A. (Somerville, D.). Canberra, 2003. 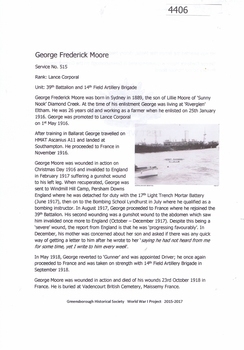 A short article about George Frederick Moore and his service in World War 1. 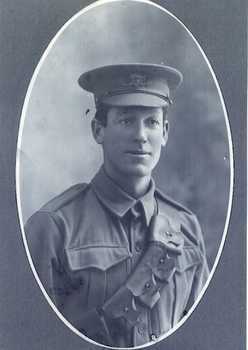 At the time of his enlistment he was living at Eltham. George Moore is commemorated on the Greensborough State School Honor Board. TRENCH MAP, 1:20,000 FRANCE. Sheet 36 NW. Edition 6 B. GSGS 2742. Ordnance Survey 1916. Trenches corrected to 5/5/1916. 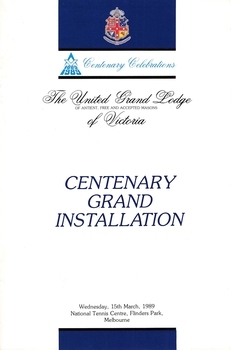 A printed document of coloured card cover and glossy pages. 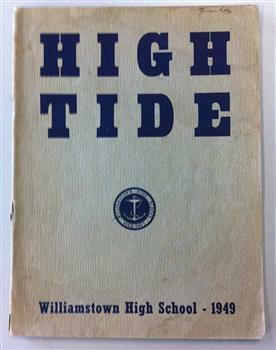 A snapshot of the year 2014 in the life of Williamstown High School, this book contains Principals' message, sport and academic results, student work, reports on student events, camps, productions. 165 p. ; col. ill.
Post Office Receiving Pillar, or letterbox.1885 “High Door Round” design. Tall cast iron cylinder with decorative dome cap with crown on top. Side has a slot and a hinged door with handle shaped as a fist. Painted red with gold trim. “POST OFFICE / RECEIVING PILLAR” lettering cast into cylinder. Restored in 1980 and once again operating as an Australia Post mailbox. Commemorative plague on pillar. 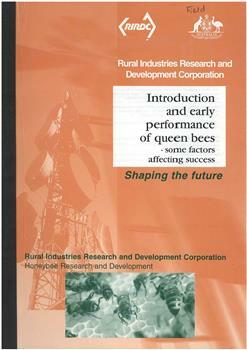 Publication - Introduction and early performance of Queen bees: some factors affecting success. (Rhodes, J. & Somerville, D.). Canberra, 2003. 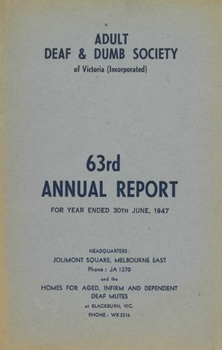 The City of Moorabbin Historical Society was formed c 1960 by a group of Moorabbin residents who were concerned that the history of the area should be preserved. 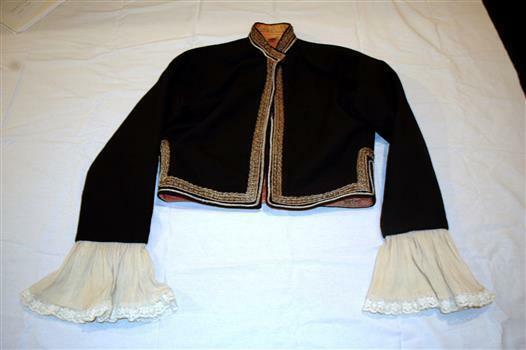 A good response to a call for items related to the historical area of Moorabbin Shire brought donations of a wide variety of artefacts which are now preserved by the current members of CMHS at Box Cottage Museum . 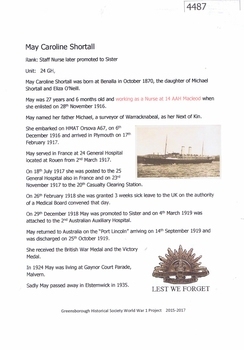 Helen Stanley, Secretary of CMHS, began producing a Newsletter for members in April 2007 to provide current information and well researched items of historical interest. 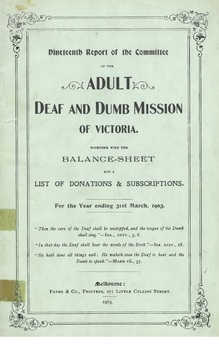 Helen Stanley has produced a bi-monthly Newsletter, 2007 - 2013, for the members of the City of Moorabbin Historical Society that contains well researched interesting historical items, notification of upcoming events, current advice from Royal Australian Historical Society , Museums Australia Victoria and activities of Local Historical Societies. The Newsletter is an important record of the activities of the CMHS. Tom Sheehy, past President of CMHS, was an Historian and Author of 'Battlers tamed a Sandbelt'. Black and white printed booklet with card cover, stapled. 46 p. ill.
On front cover 'Gwenda'. Last page contains student signatures. June Hall (nee Evans) tells her own story of growing up in Port Melbourne and later Greensborough. 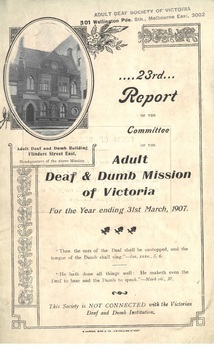 A primary source recollection of growing up in Port Melbourne and Greensborough in the mid-20th century. 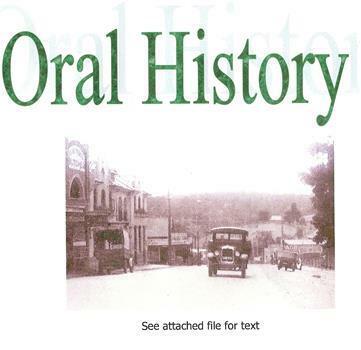 Oral History of Jean Huggett (Barnett) 1913-2004; and, Eadie Barnett(Alexander) 1914-200. Interviewed and compiled by Peter Blackbourn. Lower Plenty. Rosanna Golf Club. Barnett family. 22 page A4 sized newsletter, printed in black and white. 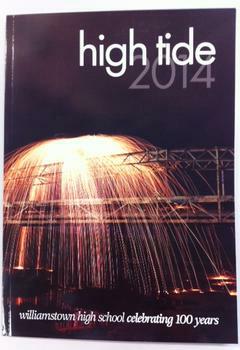 Contains message from the principal, information for parents, interviews and reviews of events. Also includes photographs. 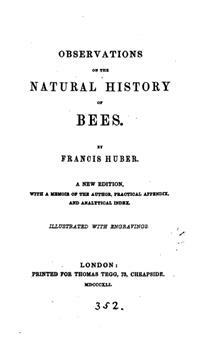 Publication, e-book - Observations on the natural history of bees. (Huber, Francis [Francois]). London, 1841. 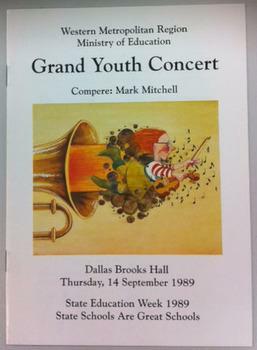 Program detailing band and items performed at the Grand Youth Concert at Dallas Brooks Hall in 1989. Six Williamstown High School music students performed at the event. Bookletis B5 size,16 pages with a full colour illustration on the front cover. 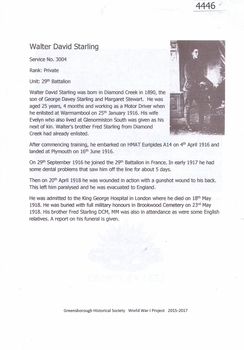 A short article about Walter David Starling and his service in World War 1. Walter Starling was born in Diamond Creek. . Printed on white A4 paper. Approx 92 pages (not numbered). Illus., maps. 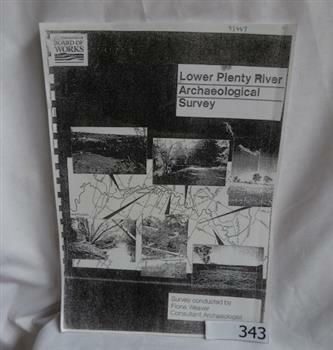 Archaeological survey of the Lower Plenty River undertaken in 1989-1990 by Fiona Weaver for the Board of Works. Indigenous heritage sites along the Plenty River are examined and recommendations made for the preservation and to lessen the impact of development on these sites. A short article about Nurse May Caroline Shortall and her service in World War 1. When she enlisted, May was working as a nurse at 14 AAH Macleod. 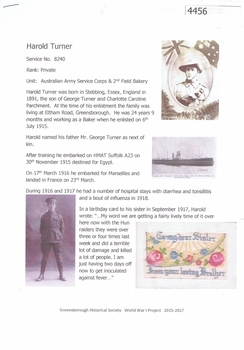 A short article about Harold Turner and his service in World War 1. Harold Turner lived in Greensborough. Batch of 1 photograph and 2 documents relating to James and George Young. Research material from the WWI project. 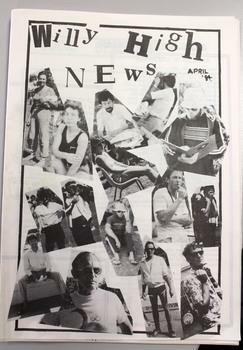 1985 School Magazine with 28 un-numbered pages. 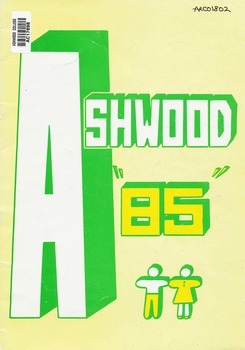 1985 Magazine of Ashwood High School with historical events of the year.